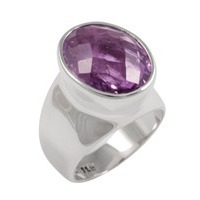 This is the regal gemstone, amethyst, an abundant treasure found in almost every corner of our planet. Coveted by kings and queens and sought by high priests, magicians, monks and bishops for thousands of years, there is no doubt that if it were harder to find it would be very expensive indeed! Read on to discover the powers of the equalizer and soother that is amethyst, a gem that has been part of the human experience since Time Immemorial. Occurence: Mexico, Brazil, Uruguay, Sri Lanka, Siberia, Canada, India, Bolivia, Argentina, Zambia, Namibia, USA, Australia and many other places. Amethyst is a very common macrocrystaline variety of Quartz (SiO2) with an almost global distribution. “Macrocrystaline” means that it forms as clearly visible crystals. These crystals occur as either long prisms with a six-sided pyramid at either end or, more commonly, as druzy – a mass of crystal points forming a crust that lines the inner walls of underground fissures or gas pockets in igneous rock. In Brazil, these underground pockets, which are known as geodes, are very common and are often mined for ornamental uses. They are quite a sight to behold, resembling little caves glittering with a mass of purple crystals. The largest of such geodes ever recorded measured ten by five by three metres and weighed approximately 8 tonnes, but many are small enough to be held in one hand. 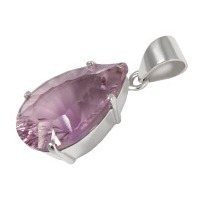 Typically, Brazilian amethyst is pale purple, and only the tops of the crystal points tend to display any colour. In contrast, Uruguayan amethyst, which also forms inside geodes, displays a uniform, deeper purple colour. Peculiar to Uruguay are stalactites encrusted with amethyst. These stalactites, when sliced along the cross-section, reveal a beautiful flower-like formation featuring ‘petals’ of amethyst crystals radiating from a heart of agate in banded colours. 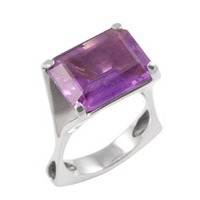 African amethyst tends to be the most highly prized for gem cutting because of its rich colour and clarity. 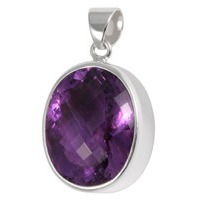 Though amethyst is often gray or colourless, it is definitely the colour purple that we immediately associate with it. Essentially, amethyst is clear quartz which, in common with many of the world’s most beautiful gemstones, contains impurities of other minerals which are responsible for the colour. In this case manganese and iron oxide (Fe2O3 ) are present. The greater the concentration of iron, the more intense the purple colour. An interesting phenomenon is the impact of heat on amethyst. Heat will influence the oxidation state of the iron impurities present and the colour will change accordingly. The source of heat may either be artificial or the result of natural thermal activity, but the effect is the same. This is, in fact, how citrine is formed. Citrine is also quartz with iron present but the iron has been oxidized to a greater degree by heat, turning the crystal to yellow, orange or reddish-brown. In some instances heating can turn amethyst green as well (known as either green amethyst or prasiolite), though this is very uncommon in nature. Sunlight is known to cause amethyst to fade to clear. Amethyst’s recorded history is a long and illustrious one. 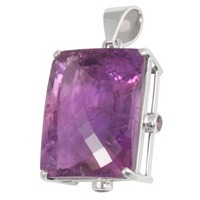 It was known to the ancient Greeks who named it “amethystos”, meaning “non-intoxicating”. It was believed to protect one from drunkenness and intoxication, particularly if one drank from a cup carved of amethyst. Pliny wrote in the 1st Century that its name actually referred to its resemblance to wine. According to Roman legend the god of wine, Bacchus, who bore a grudge against humans, set his lions on a maiden named Amethyst who was on her way to pay homage to the goddess Diana, the Huntress. The maiden called out to Diana for help, and Diana turned her into clear crystal. Bacchus, full of remorse, poured wine over the crystal as a libation, and the crystal absorbed the colour of the wine. In medieval times it was used as a talisman to prevent not only the excesses related to intoxication from drinking, but also the intoxication of love. It was thought to quell the passions and encourage abstinence, making it useful for those who practiced celibacy. In fact it was embraced by the Catholic clergy as a symbol of piety and used in the Middle Ages to decorate churches. To this day, bishops wear a ring of amethyst. Leonardo Da Vinci noted amethyst had the properties required to dissipate evil thoughts and sharpen intelligence. In more ancient times amethyst amulets were used for healing, to ward off evil, for protection in battle and to assist in the hunt. Amethyst has long been associated with royalty and has embellished the garb of various kings and queens through the ages including the ancient Egyptians, Catherine the Great, who sent thousands into the Urals to seek out the stone, and the British Monarchy. One of the 12 stones worn in the breastplate of the Jewish high priest over 2000 years ago was an amethyst. Amethyst is a calming and soothing stone with a sobering, down to earth aspect. Tibetan Buddhists dedicate it to the Buddha and often fashion rosary beads from it with the belief that it creates the clarity of mind required for the spiritual journey. Indeed, it is valued as an aid in meditation. It is said to guide us towards our highest ideals, transforming lower vibrations into higher ones, while maintaining a sense of composure, strength and serenity. Its soothing nature coupled with its tendency towards fairness and patience make amethyst a useful tool for reconciliation, promoting compassion, empathy and understanding. Not only is this beneficial in relationships, but it also promotes balance and reconciliation between an individual’s physical, emotional and intellectual bodies. A hot, over-emotional temperament may find some peace and contentment with amethyst’s help. The amethyst “flowers”, produced from slices of stalactites, are said to carry a sense of lightness and lovingness. Perhaps it is amethyst’s soothing nature that has earned it a reputation for alleviating insomnia. It is said that placing it under one’s pillow helps lull one to sleep. Its ancient reputation for neutralizing the effects of alcohol still stands amongst modern holistic healers who recognize its benefits in helping to overcome addictions, be it to alcohol, drugs or anything else. Amethyst opens the crown chakra, clears the aura and protects against psychic attack. When combined with chlorite it can be used to cleanse both the physical body and aura of unwanted energy. It has been used to treat disorders of the nervous and digestive systems, to help with hearing disorders and to improve and strengthen posture. It is also said to relieve headaches and arthritis pain. 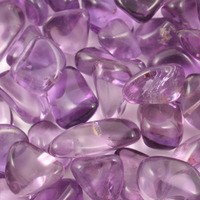 There is a material side to amethyst as well, its deep and passionate colour said to promote prosperity. 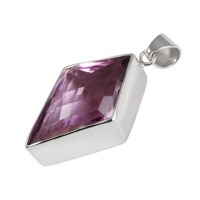 Amethyst is the anniversary gemstone for the 4th, 6th and 17th years of marriage. It relates to the horoscopes of Pisces, Virgo, Aquarius and Capricorn and vibrates to the number 3.